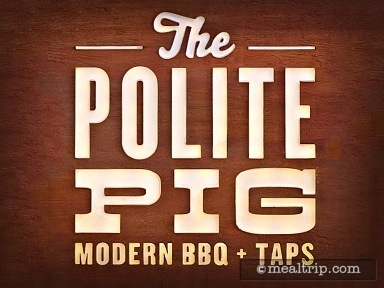 Bring your appetite to a modern barbecue outpost featuring Florida-inspired cuisine and an array of libations on tap. Savory wood-fired fare and an extensive selection of whiskies are hallmarks of this family-run eatery. The meal for two offered small portions for the price. The pickled beets were different and enjoyed as was the cauliflower. Not a place that we need to return to for what we got. If we do stop in, we would try the pork sandwich. If you park in the "Lime" garage at Disney Springs, it's hard to enter the shopping area without smelling something (usually meat) being wood-fire grilled at the Polite Pig. Not great -- if you're following a plant-based diet… but for carnivores, it draws you in, like a moth to a light bulb. I decided to stop in the other day to grab a quick sandwich and side, curious to discover if the flavors lived up to smells. I'm happy to report, they do. 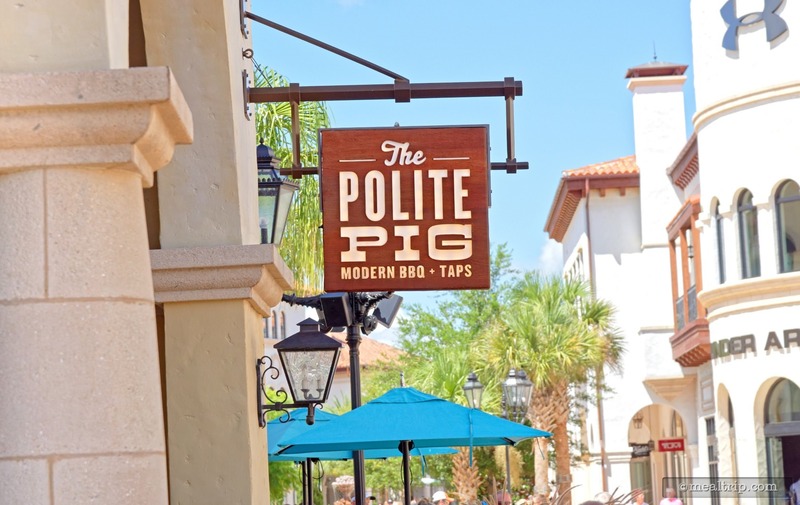 That's not surprising though… the ownership behind The Polite Pig operate several award winning restaurants in Central Florida -- the cleverly tag-lined Farm-to-Terminal dining experience that is Cask & Larder at the Orlando International Airport, DoveCote Brasserie, and perhaps the most famous... The Ravenous Pig in Winter Park. We don't have many interior shots of Disney Springs locations yet, but we're getting closer to doing that… but the interior and seating environment was ok for what it is… a quick service dining location. Like most Disney locations these days, I found the seating to be a little tight. There is some outdoor patio seating, a couple of backless bar stools inside, and then a main interior seating area that offers a mix of backless stools around high boy tables, and (fortunately) some traditional chair and booth style seating. Even though this could be messy food, the servers do manage to keep the area quite clean. This is one of those (kind of strange to me anyway) spots where they'll ask if you want to pay for a server's "tip" at the register when you're ordering and paying for your food. Once paid for, you'll be given a table pager and in my case, an empty cup for soda (yes, there are free refills on soda, yay!). After you get your soda, find a table (inside or outside on the patio) and usually within five minutes, your order will be delivered by one of the location's servers. Is this person, "your" server? It's hard to say, because no less than four different people helped me out during my lunch. The person that cleaned the table and made it spotless before I sat down, the person that delivered the food, the person that delivered my silverware (because the person that delivered my food and the person that cleaned the table didn't give me any), and finally the person that came over to make sure that everything was good, a couple of times throughout the meal. Everyone was really nice… no complaints there. This is probably just the businessman in me though… the "tip" at the register is about as disconnected from the quality of service as you can get. I get it. I get why they do it that way… Disney Dining plan, people paying with wrist bands, etc. they want to make the "pay" process one-stop for guests. But there's no way for me to know if I'm going to get good or bad service until after the meal. This sort of turns into a thing where some guest will pay for a 10% "tip" at the register, some will not -- everyone splits the money (which I'm not sure is even legal), blah, blah, blah, etc. Look… just charge 5% more for the food and flat out pay the cast members more -- and that will allow you to keep the best ones working for you. Soap box off. The "Southern Pig" sandwich that I selected was actually pretty amazing. This is not a fake, red sauced-up, theme park BBQ, but a real (recently) live pulled pork that was properly juicy and and smoked. While $12 with no side does seem to be a little high, it was a large sandwich and the pricing is in-line with the rest of Disney Springs. The fennel-apple slaw topping added a nice crunch and as the menu states, there is a light mustard sauce and a little Duke's Mayo in there too. 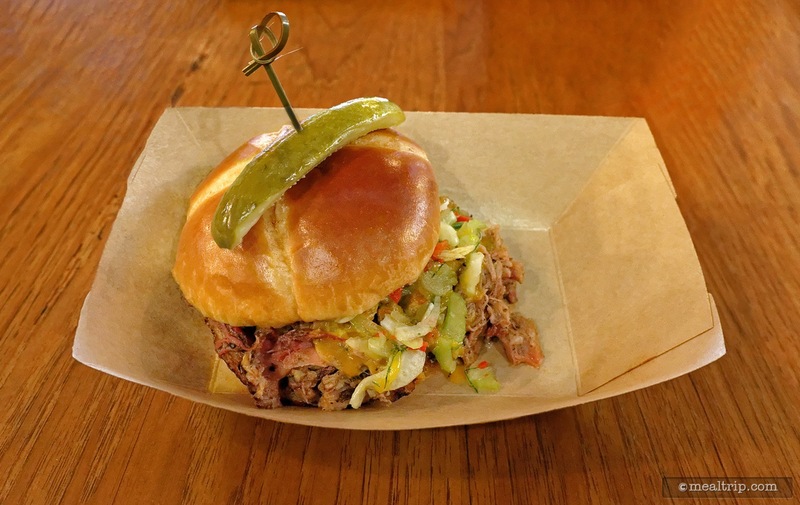 This does make the pork a little mustard-forward, so if you're looking for just the smokey goodness of BBQ, I'd go for the Pork Shoulder that's served as a platter and not the sandwich. 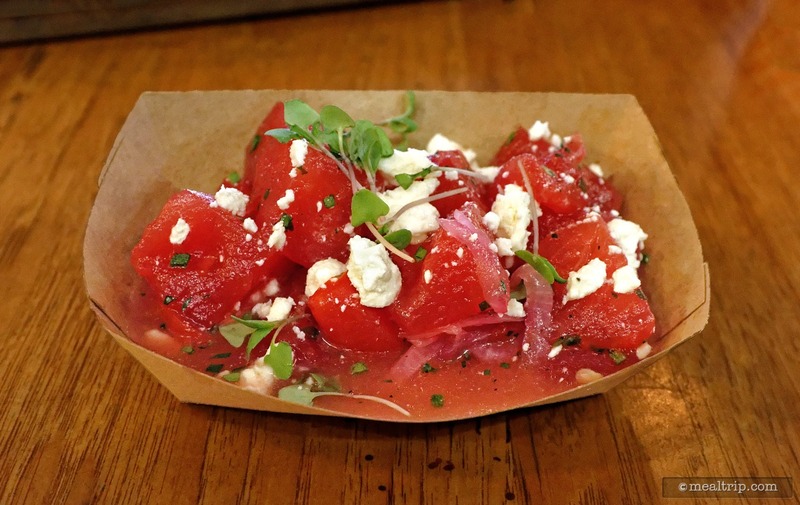 I also picked up a side of "Tomato and Watermelon Salad" with feta and pickled onions. Here again, this was a good sized portion and the components were well mixed. The acidic play between the tomato and onion works so well with the sweet watermelon and crumbly dry feta. Most importantly, the salad as a whole, worked very well with the pulled pork sandwich! All in all, a great lunch. Disney Springs (while charging what I would estimate to be about a 30% premium over what similar foods would cost outside the system) -- is shaping up to the "the" place to eat while on a Disney World vacation. 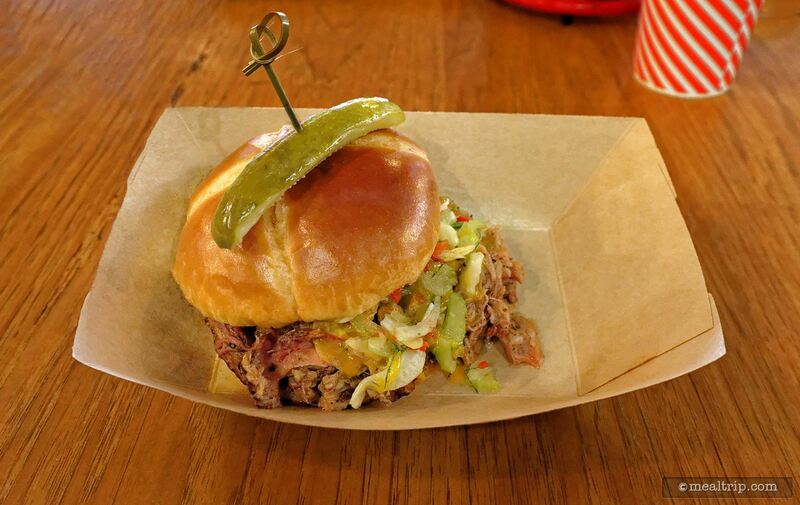 I'm not knocking the universally accepted, theme park, sticky red sauce, bbq pork sandwich -- there's a time and place for those -- but it was really nice getting a proper smoked, pulled pork sandwich, and I could easily see this as being one of those food items that you could absolutely say "I want to go back there for another one"… and that… is what it's all about! If you're in the mood for quick service fresh smoked and barbecue meats (and salmon too)… check this one out. 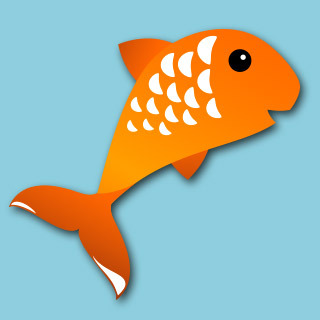 It get's a "must try" from me!